Some of you may have seen this article before, which I wrote in 2008. I am posting it now by request. Now into my 4th week of kickboxing, I see clearly that learning to kickbox is simply dressage for people. It’s all about building strength and flexibility, but this time it is my job, not my horse’s, to do the physical work. The trainer hasn’t yet uttered the term “gymnasticising” but I have a suspicion she is thinking it. I should have seen this epiphany coming. On Day One, I was smugly confident that I, a former intercollegiate athlete afterall, would pick up this sissy-pants kickboxing in a snap. Alas, pride goeth before a fall. Five minutes into the class I was reduced to giggling at my coltish attempts to keep in step. Occasionally off the beat, often with legs entangled, I began the journey as a goofy young horse–no balance, no muscle tone, but happy to go. During this time, I relied heavily on my trainer. The manner in which I looked to her is just as young horses look to us: “Um, a little help?” What elevated my favorite trainers was their gift for simply preparing me to succeed. Perhaps as we were doing a side kick she’d say, “Forward kick in 3, 2, 1”, so that I could be thinking about how to change to the forward kick before I was asked to do it. Transitions presented in this manner were simple and fun to perform. If trainers did not give this “verbal half halt”, the transition would be disorganized and rushed. Worse yet, repeated muffed attempts would leave me vaguely frustrated, and perceiving myself as incompetent. I realize, with more than a little sadness, that I have felt horses experience this frustration with me. The kickboxing horsie in me, and the grass-munching ones in my pasture, appreciate having a little “heads up”. My inner horsie learns best with occasional praise. As my legs flopped about, while my neighbors’ kicks snapped vividly, I was acutely aware that I was not competent. From my viewpoint as I struggled, the best trainers responded by encouraging improvement rather then by highlighting shortcomings. Good trainers trust that people and horses would prefer to be competent, and therefore generously acknowledge improvement. This tactic encouraged my inner horsie to strive more cheerfully and probably more effectively. With some effort, I’m about a 2nd Level Kickboxing Dressage Horse these days. Mostly balanced, and I have to admit, a little overconfident at times. “Ah, yes, next comes the boxer’s hop and then a side kick,” says my presuming inner horsie. When a front kick comes in where the side kick should have been, uppity inner horsie morphs to attentive inner horsie in a hoofbeat. There’s nothing like a little variety to keep that inner horsie tuned in. Timely half halts, honest praise and creative work. Today I was a kickboxing dressage horse, and for me, that has made all the difference. So tonight I spoke with a writer who will be interviewing several horse professionals concerning bits and foxhunting for an article in the Masters of Foxhounds beautiful publication, Covertside. (Also on line as eCovertside). Here are the notes I wrote up for her before we talked. They are my thoughts on bitting and training horses and riders to do downward transitions in general. They are in no particular order, but maybe you will find them interesting, useful or maybe a point to correct me on next time we meet. Enjoy! Horses stop because they were taught that they would get a release in their mouth when they react correctly with their feet. Bits don’t stop horses. Training stops horses. Putting on a bigger bit when your horse is not acting as you wish is exactly as effective as shouting more loudly to someone who speaks another language. Many horses brace, tighten and run from mouth pain. Then some riders think they need to turn up the bit severity and pull harder. Then the horse pulls harder in response. It becomes a spiral of increasing tension. If you turn down the bit severity, and spend a little time acclimating the horse to the new contract of “rider is light in the reins, horse is light in the bridle” horses can become less defensive and subsequently hear a softer message more easily. Often the answer is less bit and some rider help. A kineton is another way to put a governor on bit pressure. When the kineton was first introduced, people thought it must be harsh because even the hardest pullers and bracers would respond better to the bit. It turns out the hardest pullers and bracers were the most sensitive and only pulling and bracing to protect their mouths. When they didn’t have to protect themselves from their mouth pain (because the kineton did), the riders got better results. If you are using a curb with a chain, you may have better effect if you switch to a leather curb strap or add a rubber channel over the chain. If you insist on using a curb chain only, the thoughtful way to do it is to twist it so that the chain lies flat. 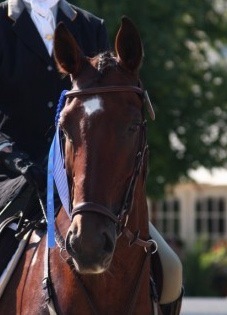 A horse has many nerves that run in the chin groove and the best effect elicited there is with a gentle aid. A horse stops best by using his hind end. When riders signal a stop or downward transition by opening their hip angle, closing their thigh and engaging their core before using their hands, the horse has a shot at producing a balanced and expedient transition. Wearing a grab strap saves accidently water-skiing off a horses’s mouth when going up hill or at other times when balance may be at issue. Pulling when you don’t mean to “wears out the brakes” just like over breaking in your car. 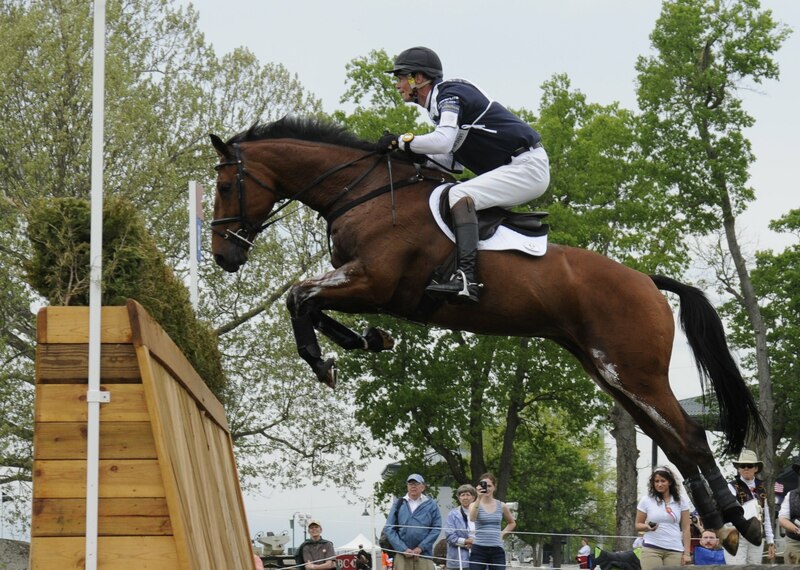 William Fox Pitt, who has won the Rolex Kentucky Three Day Event several times, wears a grab strap. Halting using only your hands (which only activates the bit) will produce a horse that stops on its forehand, in a heap. It feels like stopping a horse trailer with draft horses in it with only the truck brakes – the back end pushes the front and the stop takes longer. Or think about stopping a bicycle using only the front brakes – the back end comes up, the front end goes down. Brake too hard with the front only, and the back end comes over the front. This is the opposite effect of what we want in a downward transition. But, when a horse is allowed and encouraged to use his hind end to stop (by the rider opening her hip angle, closing her thigh and engaging her core and “stopping” herself before pulling on the reins) the transition feels like stopping a trailer when the trailer brakes are working perfectly, or like stopping a bike with the back brakes. The back end stays down and the front end stays relatively up. The transition feels, and indeed is, balanced, and is usually executed more quickly and with less fuss from the horse. This video changed my riding life. When I watched it, I was astonished at the amount of daylight that can be seen between his knee and the saddle in many instances, and between his thigh and the saddle nearly continuously. The man is not holding on with his thighs one whit. His calf is active ALL THE TIME, and usually in a rhythmic manner. The exception is the last two strides before the jump when his calf appears to be just seriously ON. I’ve been doing a lot of riding since I saw this video for the first time a few weeks ago and have consciously been riding with MUCH less thigh and MUCH more calf. Eddie likes it. The result has been a rounder horse and a thigh that is available for a half halt, rather than a thigh that is like a parking brake engaged when the car is in drive. Ok, first, watch this astonishingly candid commentary by Andrew Nicholson with video of his Burghley xc ride. Each time I watch it I see something new. Tomorrow I will post about the one thing I will never forget about it and how it has already changed my riding.